How can careful consideration of groups at work enhance the learning of preschool, elementary, and middle school students and their teachers? Building on research conducted with educators from the Municipal Infant-toddler Centers and Preschools of Reggio Emilia, Italy, researchers from Project Zero collaborated with pre-Kindergarten to grade 8 teachers in Massachusetts to examine how ideas developed in Italian preschools could enhance preschool, elementary, and middle-school education in the United States. 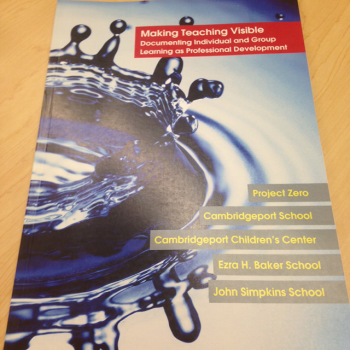 Making Teaching Visible includes the stories of what the teachers learned through documentation and provides a framework for considering how documentation of individual and group learning can serve as professional development. Because it also contains thoughts on how to support this type of professional development, it provides a valuable tool for making classrooms and schools more powerful learning environments.